The effects of South Africa’s economy being downgraded to junk status continued to be felt in the new vehicle sales industry. 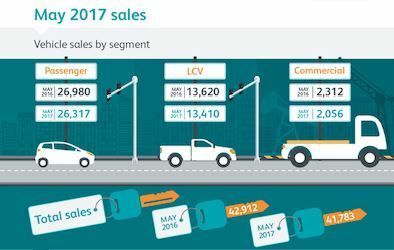 New vehicle sales for May 2017, as reported by the National Association of Automobile Manufacturers of South Africa (Naamsa), saw a year-on-year decline of 2.6%. In April, year-to-date sales volumes had shrunk 1.4%. With May’s decline, year-to-date sales are now down 1.7%. The rental channel saw a positive performance, with May’s 6.8% sales increase pushing year-to-date growth to 20.1%. However, these gains were outperformed by the 2.5% decline in passenger vehicle sales – the largest segment in the market. Two indicators of this uncertainty among consumers are seen in WesBank’s data. In May, there were year-on-year increases for average deal duration in both the new and used market. Statistics showed that consumers were hesitant to replace their vehicles, with the replacement cycle extending by 9% compared to May last year. Those who did return to the market chose to manage risk by opting for fixed interest rates, to avoid potential future rate hikes. Data from WesBank shows a 19% increase in demand for fixed interest since South Africa’s economy was downgraded to junk status. Affordability and value-for-money also continue to factor into purchase decisions. Demand for balloon payments has risen 13%, year-on-year, showing that consumers are seeking ways to lower monthly instalments. The demand for used vehicles continued unabated, with the used-to-new ratio reaching 2.37-to-1 in the past month.